Partick Thistle play Kilmarnock this weekend, with the pleasant situation being that Thistle are safe in the Scottish Premiership for another year, but Kilmarnock still need to keep an eye on other results for their own safety. 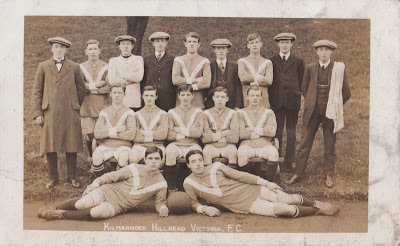 I've taken this as an excuse to investigate my family football connections in Ayrshire, which includes a few Juniors teams and one Scottish Cup winner's medal. I like Ayrshire football teams. They just seem like genuine, long standing, integral parts of their local communities. I grew up in Maryhill supporting Partick Thistle. This means that over the years my team has often been found jockeying for league position with Ayr United or Kilmarnock and a short trip to Somerset Park or Rugby Park is always one that I enjoy. However, in terms of success, the Ayrshire Junior Football teams often eclipse their senior neighbours. As children, my brother and me were sometimes taken to see Maryhill Juniors play at Lochburn Park, or Yoker Athletic down at Holm Park. In fact I think Lochburn Park is the only Scottish ground I've been threatened with being kicked out. As bored 7 and 9 years olds we were scolded by someone at the club for kicking lumps of harling off of a wall that was distracting us during a less than scintillating game. However, the real blood and thunder of Junior Football is best captured by a roll call of Ayrshire football clubs. Auchinleck Talbot, Hurlford United, Maybole Juniors, Irvine Meadow, Glenafton Athletic, Beith Juniors, Cumnock Juniors and Irvine Victoria. I have a big pile of old photographs and postcards that I got from my Kilmaurs-born grandad, and I've enjoyed trying to find out about the people in them. A lot of the family history research that I follow up on my Kilmarnock ancestors revolves around the same things: mining, trade unions, the ILP, the local masonic lodge and football. My great-great grandfather Robert Climie, was a coal miner born in 1843 in Kilmarnock. 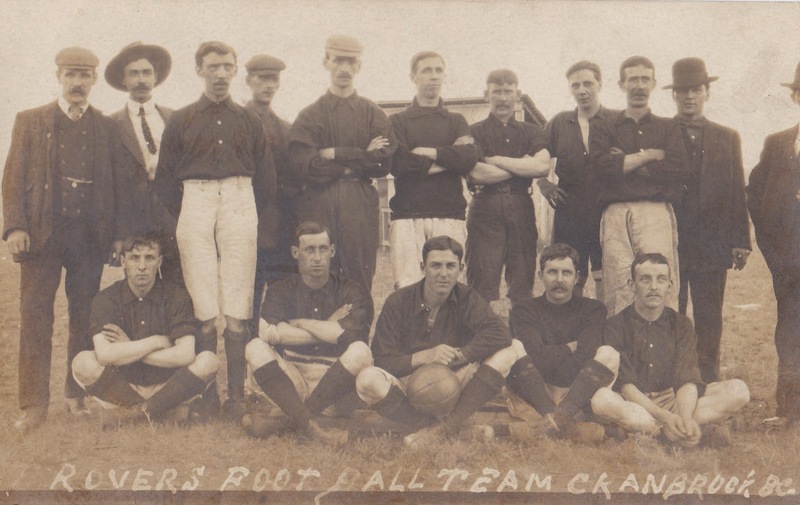 One of his sons, Tom Climie (above in the white "shorts"), a great-great uncle of mine, I could recognise in several of these old photographs which I have. I finally unpicked his story once I worked out where the football team he was photographed with in about 1910 were from. (I've written about it here.) He emigrated to Canada in 1907, where he worked as a coal miner and played football regularly there for his local team. He was 24 years old when he emigrated so it seems likely that his football education was in the junior teams around Kilmarnock. One other photograph that it has taken me a while to get to the bottom of is this one below. There just seems to be very little trace of a football club called Kilmarnock Hillhead Victoria FC. Also I had been unable to recognise any of the faces in it, but that was because I guessed the age of the photograph wrong by about 20 years. 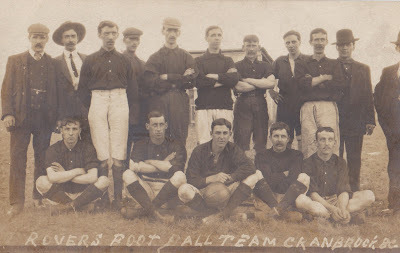 However I have now finally tracked this team down in a fantastic online archive some people have put together. They are trying to document all the football teams of Scotland from 1829 and at present it lists almost 7000 teams. In this file Kilmarnock Victoria Junior Football Club get the briefest of mentions, as they only existed from 1888-1889. At that time there were numerous local junior teams just in the town of Kilmarnock alone. A booklet published in 1919 documenting the first 50 years of Kilmarnock FC maybe offers an explanation for the demise of the Kilmarnock Victoria team in 1889. From "Fifty Years, Kilmarnock Football Club 1869-1919"
"The following season 1888-1889 a new team had to be rebuilt for a wholesale migration took place about this period.....the playing stock was replenished at the expense of the junior clubs - Thistle, Rangers and Victoria with such well known exponents as Bummer Campbell, Andrew Campbell, Tommy Lyle, John Brodie, John Johnstone, James Gray, John Porter, etc"
The other teams alongside Kilmarnock Victoria mentioned in this passage are Kilmarnock Thistle who played at Howard Park at this time and Kilmarnock Rangers who were on the go from 1887 to 1891. "Bummer" is a first name which I fear has drifted out of fashion in recent times and is maybe due for a revival. So this allowed me to date the photograph above to about 1888, which is much earlier than I had thought it was from. So rethinking who would have been about the right age at that time I think that I can see my great-great uncle George Climie in the photograph, who would have been about 17 years old. See what you think. These two photographs below are taken about 10 years apart. 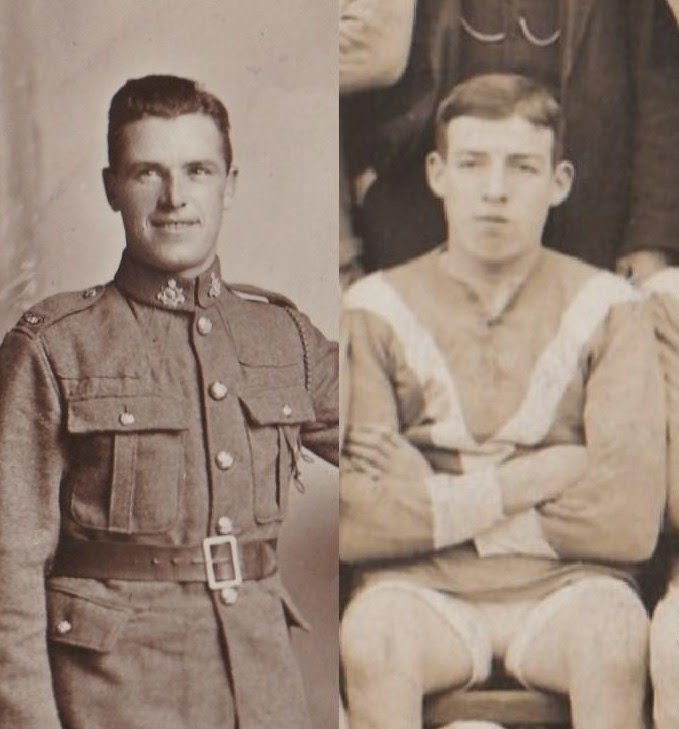 Do these two people, a 27 year old soldier and a 17 year old Kilmarnock Victoria FC player, look like the same man? For me the best way to check this is for Kilmarnock to manage to stay in the Premiership for another season. If so my first stop on our next away game in Kilmarnock will be to the local archives to try to dig out some old newspapers with Junior Football match reports from 1888. I'm sorry to say that would be a happy way to spend a morning for me. Of all my Kilmarnock ancestors only one of them truly made a name for himself as a footballer, a close cousin of those mentioned above. As well as winning a Scottish Cup winner's medal with Kilmarnock in 1929, his claim to fame is that he was the first ever goalkeeper to save a penalty in a cup final. My ancestors were not as fastidious as we are nowadays about spelling their names consistently, and although Sam Clemie's dad, James Climie, usually spelled his name the same way as my branch of the family. Sam (and many other of my Climie relatives) went for Clemie. Born in April 1904 in the hamlet of Cronberry in Ayrshire, Samuel Turner Clemie was a blacksmith to trade. His father was a coal miner, describing his job in census returns as a "drawer in pit", the man who was employed to take the full tubs from the coalface and return with empty ones. When he married Mary Turner in 1893, James Climie was living in Lugar in Ayrshire, a mile down the road from Cronberry and just outside Auchinleck and Cumnock. Lugar is a village 16 miles south east of Kilmarnock whose 1500 residents at that time were employed in the local coal mines and the Lugar Ironworks. After 1928 work became harder to find locally when the Lugar Ironworks closed down. As a young man Sam Clemie was playing in goals for his local juniors team, Lugar Boswell FC, in 1925 when he signed for Kilmarnock FC. Lugar Boswell, known as The Jaggy Bunnets, were founded in 1878, and still play at their home ground of Rosebank Park in the village, although since 1945 they have been called Lugar Boswell Thistle. Another notable player who learned his trade at Lugar Boswell Thistle was Andy Kerr, who played for Partick Thistle between 1952-59 before moving onto Manchester City (for a fee of £11,000 in 1959! ), Kilmarnock, Sunderland, Aberdeen and Glentoran. At the time that Sam Clemie was playing for Lugar Boswell, their nearest rivals were Cronberry Eglington FC, who played a mile up the road. In 1931 Bill Shankly began his football career playing right-half for Cronberry Eglington FC after his home town team, the Glenbuck Cherrypickers where he played as a reserve, was wound up in 1930. Cronberry Eglington took their name from the Eglington Iron Company that had built the villages of Lugar and Cronberry to house their workers. Once Sam Clemie joined Kilmarnock he eventually became the regular keeper in 1926-27 season. 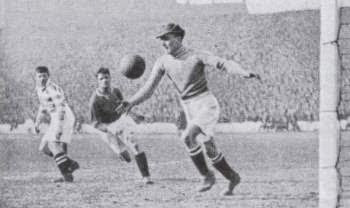 Between 1926 and 1932 he made 200 league and Scottish Cup appearances for Kilmarnock, an ever-present in the 1930-31 season. On the way to the 1929 Scottish Cup final, Kilmarnock had beaten Glasgow Uni, Bo'Ness, Albion Rovers, Raith Rovers and then Celtic 1-0 in the semi-final. They met Rangers in the final, who were the clear favourites. Having just won the league title, and only losing one of their previous 43 league and cup games, Rangers were expecting to seal a "double double" in front of the 115,000 strong crowd. After 16 minutes the referee awarded Rangers a penalty and although Tully Craig struck it well, Sam Clemie leapt to save it at his top left corner. Two goals from in the second half from Aitken and Cunningham secured Kilmarnock the 2-0 victory. As well as being the first ever penalty save in a cup final, there was also the first ever red card in a Scottish Cup Final as Buchanan of Rangers was sent off for un-gentlemanly conduct, as Rangers' frustration boiled over and he swore at the referee in the dying minutes of the match. It is reported that when the victorious team returned to Kilmarnock the crowd shouted down the Provost who was greeting them and demanded to hear from Sam Clemie. "I can save penalty kicks but I canae mak' a speech"
To rapturous applause he sat down again. 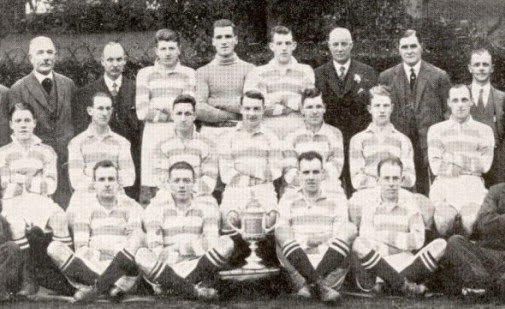 With the cup winning team he toured eastern parts of Canada, New York, Ohio and Massachusetts playing 17 matches against local teams in May and June 1930. Sam Clemie is standing on the far right of the photo below as they head off on their tour. 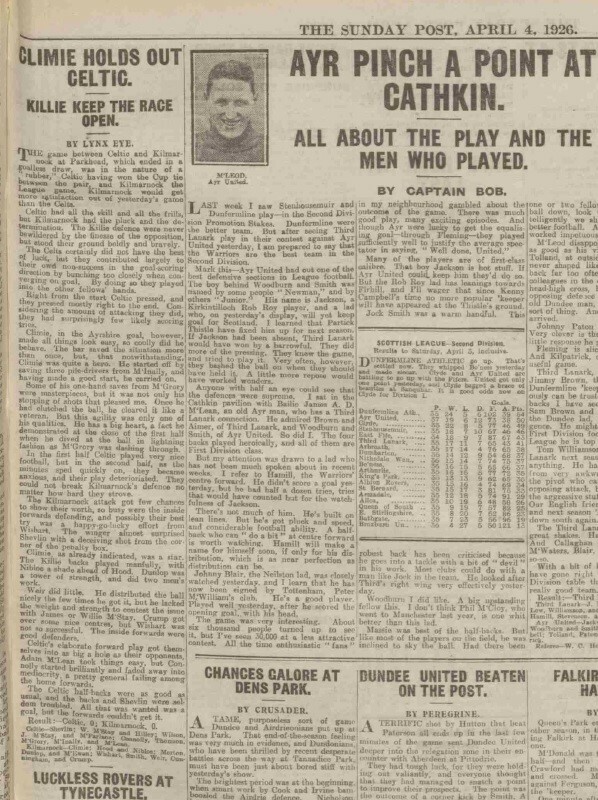 In his final game for Kilmarnock in 1932, he was in goals whilst then first choice keeper Willie Bell was rested for the 1932 cup final the following week. Sam let in 7 goals as Cowdenbeath won that match 7-1 and Killie lost the final after a replay. Sam Clemie moved on to East Stirlingshire FC in 1932 where he made just five league appearances and his senior footballing career came to an end. Aged 65 he died in 1970. The footballing genes obviously went down another side of my family, as the highlight of my football career was playing in goals for Maryhill Primary School when St Mary's Primary beat us 14-0 on their red blaes pitch. However I plan to try and take in a game or two at Lugar Boswell Thistle next season now that I've found out about those in my family more skilled at the game than me. Who knows, maybe I'll spot the next Kris Doolan who joined Partick Thistle from Auchinleck Talbot? This season, 2014-15, he has just become the first Partick Thistle player since Jimmy Walker in the 1950s to score 10 goals in five consecutive season. It's good to see your photos; thanks for posting them. My Grandpa was Jock McEwan who played for Darvel Juniors, Irvine Meadow and Kilmarnock. He played in the Scottish Cup Final 1929, and captained them in the 1932 replay. He was also on the tour of Canada, and can be seen in a few of your pictures. I enjoyed your blog - thanks again. 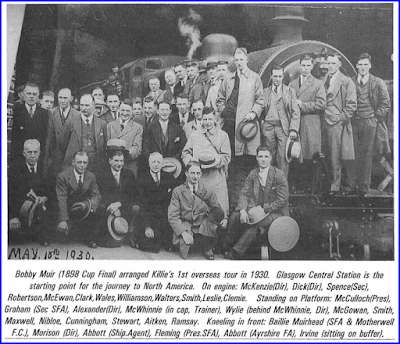 My Great Uncle was Jock McEwan who played in the 1929 Cup Final, and is front-right in the Cup Winning squad picture. Thanks for posting your story, very intresting read. Jock was my grandpa,James. We must be related. My father was Jock's son, Ian.